I am waiting for Spring. There is no better way to show it than these colorful cupcakes that I baked. I do not use artificial colours in the food I make and had no desire to use them in my baking. I had a basic idea of using natural foods to colour such as strawberry for red and blueberry for blue. So I scoured the internet to find a way to make more colours. I finally settled on carrots for orange, spinach for green, strawberry for red and blueberries for blue. 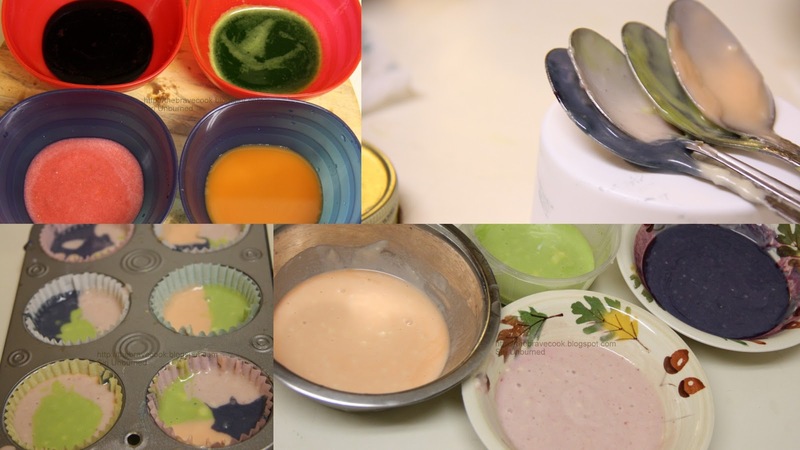 These ingredients when juiced and added to the batter would impart the respective colours to the batter but not so much flavour as the quantity they are used in is very less. So the cake is going to taste like cake. I must tell you that the colours are not going to be neon bright when you use natural foods. They are going to be pastel shades but that is what I really like. My daughter loved the muted colour combinations as well and I had to fend her off in order to take pictures first. At this juncture I must say that she is the most encouraging person in my life and the enthusiasm is rubbing off on the hubby these days. He is open to being the guinea pig more often than not! I used a basic vanilla cupcake recipe that I have made before. The only difference is to reduce milk by 2 tbsp so that 2 tbsp of different coloured juices can be added to the batter later. Juice the grated carrot with 1 tbsp of water. I used a regular Indian mixer to do this. Strain the carrot juice to get the fibrous part out. Keep 2 tbsp of orange juice aside. Keep 2 tbsp of green juice aside. Keep 2 tbsp of red/pink juice aside. Place frozen blueberries in a microwave safe bowl and microwave in 30 second intervals till the blueberries burst and the juice starts oozing out. It took me 3 intervals. Keep 2 tbsp of blue juice aside. Divide the basic Vanilla cupcake batter into 5 cups. I scooped out 4 heaped tsps per cup. To the batter in the first cup add 1 tbsp of carrot juice and mix well to get orange coloured batter. To the batter in the second cup add 1 tbsp of spinach juice and mix well to get green coloured batter. To the batter in the third cup add 1 tbsp of strawberry juice and mix well to get pink coloured batter. To the batter in the fourth cup add 1 tbsp of blueberry juice and mix well to get blue coloured batter. Keep the batter in the fifth cup uncoloured. This can be used to improve consistency in the other batters or to get a cream layer in the cupcake. Add more juice to improve colour adjusting the consistency so that it doesnt become watery. There are many ways of making the cupcakes clourful. The easiest method is to layer different coloured batters one on top of the other in the cupcake liner. Alternatively place separators in the paper liner and pour different coloured batters in each section. I started out making the separators using card. I made a 4 section one and a 3 section like that. But I found it problematic because the batters bled into other sections easily. Then the hubby gave an idea which turned out to be brilliant. Use crackers/biscuits as dividers. I had Parle-G gluco biscuits on hand and used them. I got 2 sections and 4 section ones using this method. Whatever the method fill the liners to 3/4 full and bake at 350°F for 18 minutes. Cool the cupcakes in the pan for 5 minutes before removing them onto a wire rack and allowing them to cool completely. Decorate with frosting or ganache as desired. The cupcakes turned out so wonderfully coloured that I did not want to cover that up at all.